The effect of the natural minerals pyrite and hematite as a catalyst on the efficiency in destruction of the organic matter of Domanik rock, rich in organic matter, at a temperature of 300°C in a steam–carbon dioxide gas environment has been studied. Compared with the original rock and a control experiment, the presence of the natural catalysts in the reaction system leads to an increase in both the amount of mobile hydrocarbons in the rock and the yield of extracts, in which the concentration of saturated hydrocarbons is increased by factors of 12 and 16 in the experiments with pyrite and hematite, respectively, and the asphaltene content is halved. 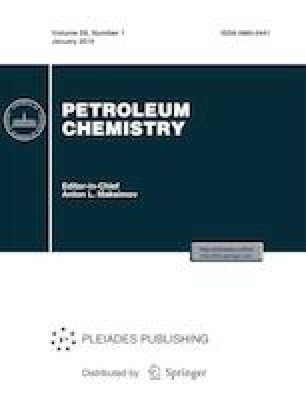 The degradation processes of high-molecular-weight resinous–asphaltenic components and insoluble kerogen lead to the formation of lower n-alkanes and the structuring of asphaltenes to increase the degree of their carbonization, followed by the formation of insoluble substances of the carbene–carboid type appearing as a new dispersed solid phase in the products. The distinctive features of the structural composition of asphaltenes and carbenes–carboids have been revealed. The close composition of the products of hydrothermal–catalytic experiments suggests that pyrite and hematite exhibit similar catalytic properties under hydrothermal conditions. This work was done at the expense of subsidies allocated to the Kazan Federal University for the performance of state tasks in the field of scientific activity. The authors are grateful to the staff of CSF-SAC FRC KSC RAS for technical assistance in research.